Take the south exit (direction Dam Square) of Amsterdam Central Railway Station. Walk straight ahead for 600 m (0,38 miles) to the Dam square; from there, walk straight on for 700 m (0,43 miles) to the Muntplein. At Muntplein turn left over the bridge in the direction of Hotel de l’Europe. Walk straight on onto the Nieuwe Doelenstraat. At the end of the street after 150 m (500 ft.), you will see a metal bridge on your right. Cross the metal bridge and walk straight onto the Staalstraat. At the end of the Staalstraat (after 150 m = 500 ft. and after crossing one more small bridge) just before a steep pedestrian and bicycle bridge over a large canal: turn right on to the Zwanenburgwal. Walk for another 50 m (160 ft.) and you have arrived at the Amsterdam Canal Guest Apartment at Zwanenburgwal 296. At Rembrandtplein walk north through the Halvemaansteeg, cross over the bridge over the Amstel river onto the Kloveniersburgwal. At the metal bridge turn right into the Staalstraat. At the end of the Staalstraat (after 150 m = 500 ft., and after crossing a small wooden bridge) just before a steep pedestrian and bicycle bridge: turn right on to the Zwanenburgwal. Walk for another 50 m (160 ft.) and you have arrived at the Amsterdam Canal Guest Apartment at Zwanenburgwal 296. At Waterlooplein underground metro station take the street exit direction ‘Blauwbrug”. When you reach the street level, turn right along the front side of the big white marble Muziektheater, following the Amstel River on your left-hand side. Walk along the Amstel River for about 200 m (550 ft.), after which you’ll already see the Amsterdam Canal Guest Apartment across the canal called ‘Zwanenburgwal’. To get to the other side you have to follow the bicycle path as it curves to the right, cross the pedestrian and bicycle bridge (curving to the left) and then turn left again at the end of the bridge. Walk for another 50 m (160 ft.) and you have arrived at the Amsterdam Canal Guest Apartment at Zwanenburgwal 296. Take the west-side elevator/stairway of this parking to the ground floor, and exit into the building, turn left and walk 40 m (130 ft.) to get out of the building. Continue straight across the pedestrian bicycle bridge and at the end turn left onto Zwanenburgwal. 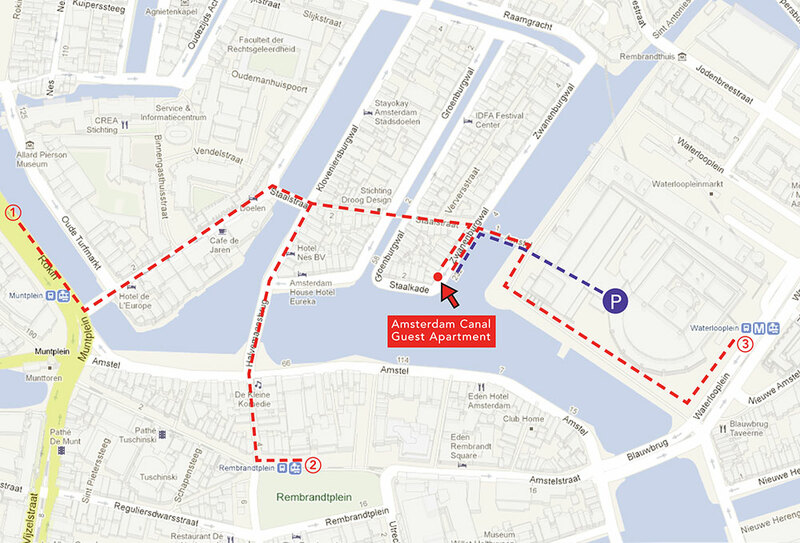 Walk for another 50 m (160 ft.) and you have arrived at the Amsterdam Canal Guest Apartment at Zwanenburgwal 296.